Each year for Christmas Eve, the CBC radio program As It Happens plays a reading of the Shepherd by Alan Maitland. The Shepherd of course being Fredrick Forsyth's novella about a lost Vampire pilot guided home on Christmas Eve by a mysterious Mosquito. 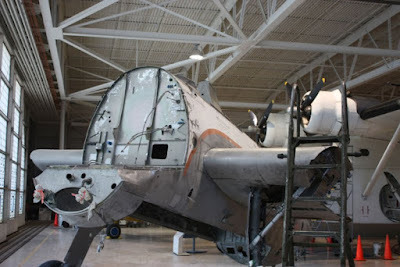 It is a great aviation story, check it out by clicking here. A really short clip of the CF-100 at Farnborough in 1955 flown by Jan Zurakowski. Buried under the snow, I found a nice surprise on my doorstep Saturday. The new Airfix Sea Harrier FRS.1 and F/A.2. The FRS.1 was immediately dispatched to the closet of no hope, but the F/A.2 was torn into with relish. I've been waiting years for a divine scale SHAR2 that was actually buildable and after spending too much money on resin conversions for the ESCI and Hasegawa Sea Harrier kits and the horrid Xtrakit rush job (and I passed on the Special Hobby kit which was the Xtrakit model with additional detail parts), I think this one will actually get built. In typical current Airfix style it is a simple kit with deep panel lines, and decent moldings. The moldings are not quite as crisp as the recent Spitfires and Hawks and the plastic is softer. (Looking at the side of the box, these kits were molded in India, rather then China. I think that is a first for me...a model injected in India.) 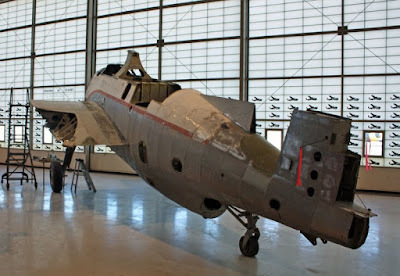 The good news is that all the F/A.2 mods are included. The longer fuselage with the new nose are captured well. The fin mounted pitot tube is included, even if it would be best to replace it with a length of metal for strength. The wings also have the necessary F/A.2 modifications. Cockpit detail is a tub, instrument panel with combing, but no heads up display, a stick, a rather small seat and a World War two style pilot. (Oddly the Spitfires had a jet pilot...oh...oh...) I planned to fit an Aeroclub white metal Martin Baker Mk.10 seat, but there is not enough room in the tub and the white metal seat is way too tall. Decals are included for the panel and consoles as there is no raised details. Weapons include Aden gun pods, the larger F/A.2 tanks, dual Sidewinders, AMRAAMs, and Sea Eagle anti-ship missiles. (I don't think the F/A.2 carried Sea Eagles.) Sadly, while the boxart shows the fuselage mounted AMRAAMs, the pylons are not included in the kit. Bummer. The airbrake may be position opened or closed, and both open and closed auxiliary intake doors are provided. (These should be open on the ground, though most kits mold them closed) There is some detail inside the landing gear wells, but also some injection pins molded into the detail. Also included is a nice engine fan for the intake. The exhaust nozzles are molded in two pieces each and may be difficult to make look good if the fit is anything other then stellar. The main gear wheels are slightly over bulged for my taste. The canopy looks clear and well molded, if a little thick. Decals are provided for 800, 801, and 899 Squadrons Fleet Air Arm in overall Medium Sea Grey. The decals look very well printed, and stenciling is included. As is becoming the norm, a full colour decal placement sheet is included for each option. I'm too lazy to get some sprue shots, but you can find theme here and here. Again, we have a nice buildable new kit from Airfix. Yes it could use a little resin and photoetch for additional detail, but for a reasonable price a nice base is provided out of the box. It is not state of the art, but it does seem like it will be a quick build. It surely beats the socks off the competition. 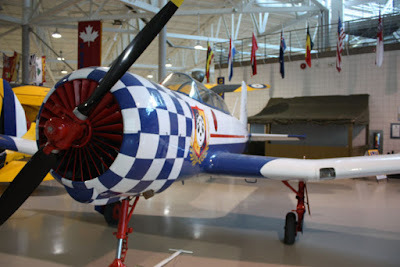 I was back in Canada a couple of weeks ago and got a chance to stop by the Canadian Warplane Heritage Museum in Hamilton. There have been a few new additions to the CWH collection this year. The Museum has recently added a new Yale to the Collection. 3400 was recently imported from the U.S. It still carries its U.S. N number N129DB. 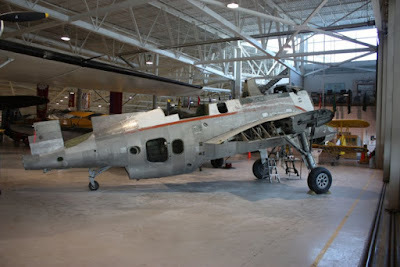 The CWH hopes to get it added to the Canadian register this winter and have it flying regularly next year. 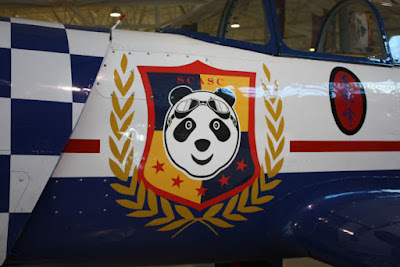 Also recently imported from the U.S. is a Nanchang CJ-6A. 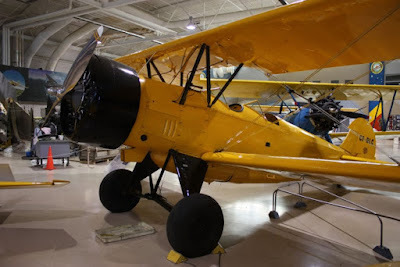 Not quite sure why a CJ in a Canadian museum, but it is a very beautiful example in a rather striking paint scheme. Again it still carries its U.S. N number N8120L, and it is hoped it will be flying regularly in 2010. Everyone loves a Panda, eh. 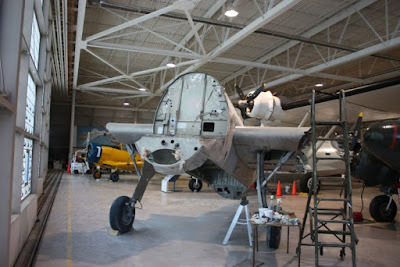 The most exciting addition to the collection is a TBM-3 Avenger. Some members of the crew were stripping paint. The CWH purchased the TBM-3E (BuNo. 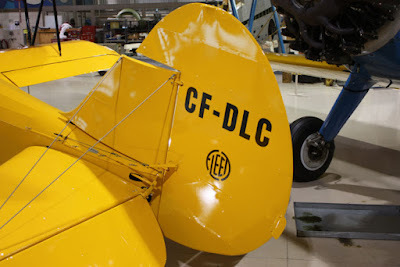 53858 former C-GFPR) from Frenchman Didier Chable who had purchased the airplane from Forest Protection Ltd, Fredericton, New Brunswick in 2000. 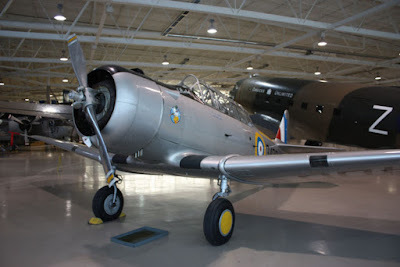 The Avenger sat at Fredericton, and while it was assigned a French civil registration (F-WQDN) it never left Canada. The CWH hopes to have the airplane flying in 2010, but it may take a few extra years. The Fleet 21 spent most of 2009 off-site getting some work done, and it looks wonderful. 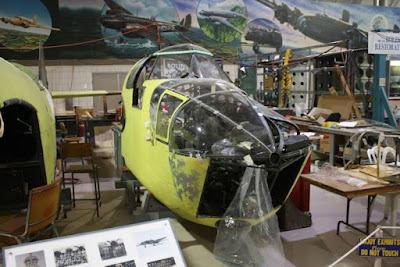 The interactive display CT-133 (CAF # 133275) has been moved off its interactive perch for an eventual repaint into Snowbird "taxi" colours. The real reason for the move however, is to free up space for assembly of the Bolingbroke. 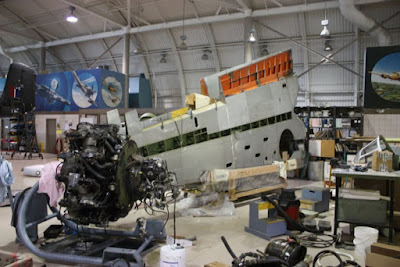 It is hoped that the wings can soon be attached to the fuselage and the project will be sitting on its gear. This is an interesting one. 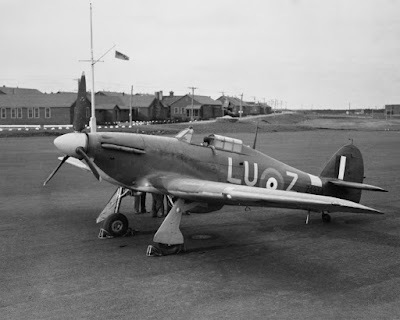 One of the hair brained ideas the Royal Navy tested during World War Two was to launch Hurricanes off merchant ships in order to provide some air defense against bombers. The idea worked, but I would hate to be the pilot alone in a single seat fighter over the North Atlantic with no airstrip within range. 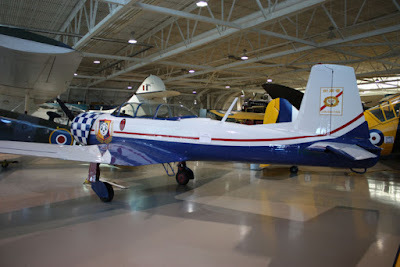 Thanks to Shane Clayton we have a clip on the Canadian Harvard Aircraft Association's new Harvard 4 (RCAF # 20304.) It arrived in Tillsonburg a couple of Saturday's ago after donation by Greg Tyrell's family. 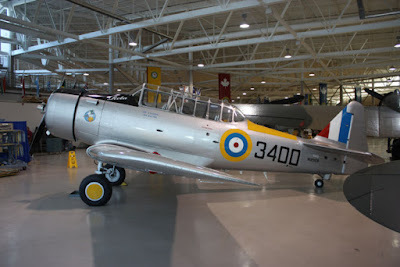 This aircraft has been in storage since being sold surplus after its use with the RCAF and is in 100% stock condition. It will now to the head of the restoration queue.